So, once again the mighty Filmonik came, saw and conquered film-making. With over 80 candidates and 80 films shot across a mere 7 days, Filmonik (and the Kino movement in general) really shows how creativity should be done. The Montage below is a mere flavour of the Magic we conjured. To see all of the Filmnoik films (past and present) check out the official Filmonik Vimeo account, and also keep an eye on the Filmonik website or all future events. I signed up for part two of the Kabaret, took part in 4 films, and also attended the screening of all films from part one. The heatwave and lab conditions (with far too many laptops, iMacs and PC's heating up the main room) were incredibly difficult, but everybody raised their game. 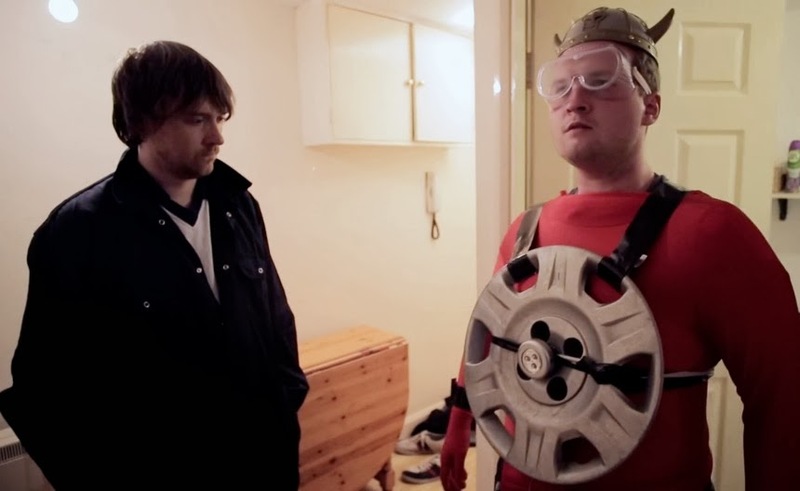 Here I am in a small role in Ben Mottershead's amazing film - IRON MANC! It is said every year, because it is true, that this year has been the best Kabaret ever. The overall standard and variety of films is simply staggering. The 4 (or was it 5?) films I got involved in barely even scratched the surface of the sheer amount of work that was taking place. We've had musicals, comedies, revenge dramas, political party broadcasts, linguistic lessons, documentaries, music videos, intergalactic intrigue, total war, film noir and superheroes. I defy you to find a better collection of films and creativity from such a talented, passionate and creative collection of people. There are two types of people in the world; those who know the power of Filmonik, and those who are yet to. See you at the next Kabaret!